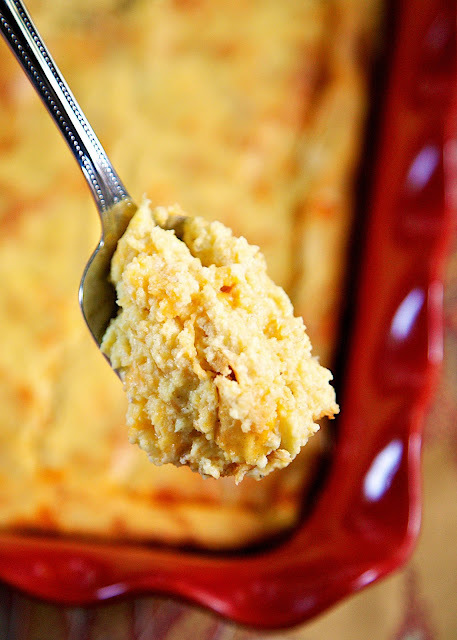 Cheddar Spoon Bread - a cross between polenta and cornbread. SO delicious! Ready in about 30 minutes. Great side dish for your holiday meal. This was my first time making Spoon Bread. I had seen several recipes in my cookbooks and decided give it a try. What is Spoon Bread? 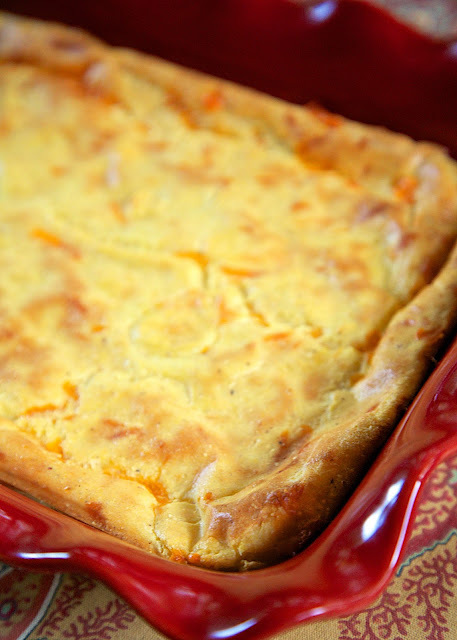 It is a cross between polenta and corn bread. It is actually quite good! I added some cheddar cheese, because I love cheese. I've also seen some recipes that add bacon. YUM! This would be a great new addition to your Thanksgiving holiday meal! The only tricky part to this recipe is tempering the eggs. Tempering is when you add some hot mixture to eggs to heat them up so they don't cook/scramble. When you add the hot cornmeal mixture to the beaten eggs, make sure you are stirring the whole time to make sure the heat is distributing evenly throughout the eggs. If you don't do this, your eggs will most likely scramble when you add them to the hot cornmeal mixture and you won't get yummy spoon bread. Preheat oven to 350 degrees. Lightly spray an 11x7 1/2-inch baking dish with cooking spray. Set aside. In a large saucepan, combine cornmeal, mik, water, butter and salt. Cook over medium heat until thickened, stirring constantly. Remove from heat. Beat eggs at medium speed with a handheld mixer for 3 minutes. Gradually stir 1/4 of the hot cornmeal mixture into the eggs, constantly beating with mixer. Add remaining hot mixture to eggs and beat until combined. Stir in cheese. Pour mixture into prepared pan.